FRBNY (at the time Tim Geithner was President of FRBNY) and JP Morgan Chase agreed to form Maiden Lane, LLC (limited liability company) for the sole purpose of acquiring about $30 billion of Bear Stearns toxic assets. FRBNY was the sole and managing member of Maiden Lane. Maiden Lane was capitalized by a $28.8 billion senior loan from FRBNY and $1.15 billion subordinate loan from JP Morgan Chase. No cash here – just debt. At some point between March 14, 2008 and December 31, 2008, JP Morgan Chase’s subordinate loan was paid off or just disappeared with interest - $1.18 billion. FRBNY senior loan was secured by Bear Stearns former “toxic assets” that were purchased by Maiden Lane. There has to be a better word than “secured” for this specific instance. 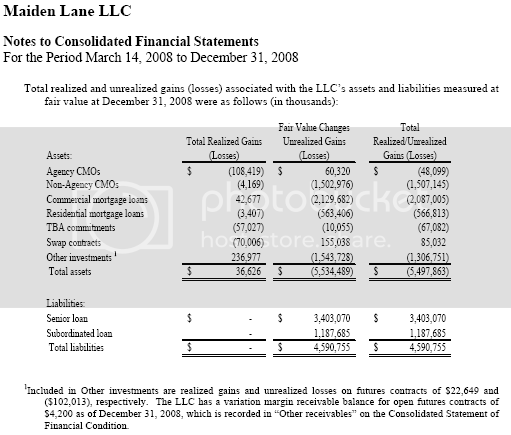 Below is the balance sheet of Maiden Lane, LLC. Looks innocent enough? For accounting purposes, the FRBNY’s senior loan is a “Level 3” liability. I thought loan terms were fairly straight forward. 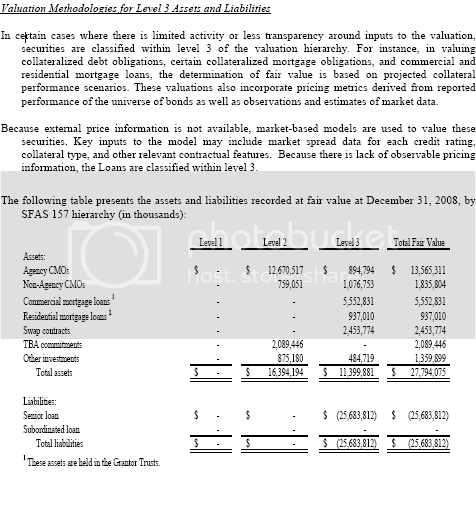 Based on this “Level 3” valuation the senior loan is worth $3.4 billion less than the original principal amount. The financial statements don’t indicate a pay down on principal. It is just called an “Unrealized Gain”. 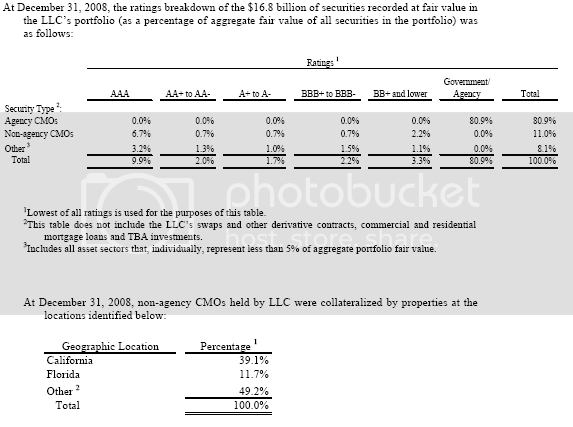 Level 3 – Valuation is based on inputs from model-based techniques that use significant assumptions not observable in the market. These unobservable assumptions reflect the LLC’s own estimates of assumptions that market participants would use in pricing the asset and liability. Valuation techniques include the use of option pricing models, discounted cash flow models, and similar techniques. Is the “Unrealized Gain” on the senior loan tied to the investment losses on the asset side? The asset side of the balance sheet is also very interesting. 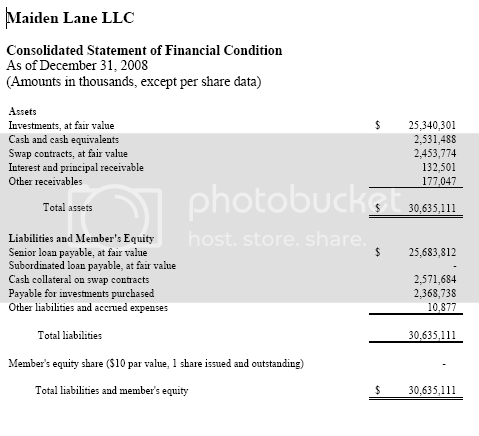 Of course the assets were worth less on December 31, 2008 than they were when Maiden Lane purchased them. How about $5.5 billion less! That is $5.5 billion investment loss in just 9 months (actually less considering June was the closing date). So, FRBNY makes a $28.8 billion loan (revalued to $25.6 billion) and loses $5.5 – so much for a return on investment. The majority of the losses were from commercial mortgage loans ($2.1 billion). Can you imagine what these losses are like now considering the continued deterioration of credit quality? How about those rating agencies? Maiden Lane lost $1.5 billion on Non-agency CMOs. Most the Non-agency CMOs were AAA-rated. Now, it is possible that most of the losses were centered on lower rated CMOs. Maiden Lane’s asset side looks very bad – the toxicity is obvious. The loan portfolio is heavily weighed in favor of commercial mortgage loans (65% of unpaid principal balances on mortgage loans). Many of those commercial mortgages loans are to hotels or the hospitality industry (83% of unpaid principal balances on commercial mortgage loans). Actually, it is worse one borrower owes 48% of unpaid principal balances of the commercial mortgage loan portfolio. That is risky! What’s deal today without credit default swaps? The LLC portfolio consists of various derivative financial instruments, primarily consisting of a total return swap agreement (“TRS”) with JPMC. The LLC may enter into additional derivative contracts during the normal course of business to economically hedge its exposure to interest rates. Losses may arise if the value of the derivative contracts acquired decrease because of an unfavorable change in the market price of the underlying security, or if the counterparty’ does not perform under the contract. At closing, the LLC and JPMC entered into the TRS with reference obligations representing a basket of credit default swaps (“CDS”) and interest rate swaps (“IRS”). The TRS is structured such that the LLC’s economic position for each CDS and IRS replicates Bear Stearns’ economic position. JPMC is the calculation agent for the TRS and the underlying values are also monitored by the Investment Manager on behalf of the LLC. The LLC made an initial payment to JPMC of $3.3 billion, which was included in the purchase price of the assets. At December 31, 2008, the cash collateral liability associated with the TRS is reflected in cash and cash equivalents and investments in the amounts of $2.1 billion and $0.5 billion, respectively. In addition, the LLC has pledged $3.0 billion of agency CMOs to JPMC. Maiden Lane was the protection seller or guarantor and it sounds like JP Morgan will make some money off this arrangement. The notional amounts of CDS were $3.6 billion but had a fair value of -$2.7 billion as December 31, 2008. I would like to know why this is necessary. At this rate of loss and considering that credit quality is not getting better, particularly in commercial real estate, it is hard to see how Maiden Lane/FRBNY recoups this $29 billion loan. This was definitely a sweet heart deal for JP Morgan Chase. The Fed would say it was necessary to prevent system-wide collapse of global financial system. I am not to sure about that because after all Lehman Brothers was allowed to fail just a few months later. I noticed that on the Federal Reserve statistical release that Maiden Lane LLC, Maiden Lane II LLC and Maiden Lane III LLC all appear. Does anyone have a list of what the assets are behind these entities or what there current status is? But the financial statements are in the first link in the above article. The balance sheets are hard to read. You can change width, height and then you can also attach the original balance sheets as a file to your post. Very very cool you used the trigger class but the zoom isn't really there to get the detail on it. Boy, it takes time to get use that function. It can only zoom to the original image size. Yeah, I know, it takes a lot of code to use it. I started on the update, ran into terrible database corruption, incompatibilities trouble, then got carpal tunnel and now am too busy. I have site update guilt and giving more image tools is one of the things on the list. (Your very guilt ridden admin/site designer). Very good post, back to the point of EP. I feel like the government pretty much got into the shell game. Supposedly the government pressure BoA to hide it's losses. A report to that effect came out yesterday. I'm assuming your post is breaking down this bloomberg report is much more detail. but the big whopping total being reported, I'm assuming all of this is worthless right? Ya know, they can scream bloody murder til doomsday at this point about systemic risk. I am now thinking more sudden shock is the problem. Anyone else notice this guy seems to have no ability to be specific? He sounds like a walking Public relations brochure, or ya know, that guy in your class who did presentations which were all boilerplate and showed little comprehension. Anyone know what I'm talking about? It's creepy. At least Paulson, you knew very specifically just how he was lying his head off.